KITsubs: Kamen Rider episode 27! This is a big episode. Goro's classmates are being lured into a team of elementary school guerilla soldiers by Colonel Zol. Taki and Ichimonji go to investigate, but before they get too far they have to face Centipedras, and some reconstructed Shocker warriors! The directing and the fight scenes in this episode are some of the best we've seen so far. But more importantly, the stakes seem higher. Colonel Zol's vile scheme to use children as undercover agents, and the reconstructed Shocker cyborgs, it all feels like a very big cinematic plot. And it makes for a great episode! There's also a great scene between Taki and Ichimonji in the middle of the episode. Keep an eye out for it! If you're wondering where we were last week, then head over to Midnight Crew Subs' blog. We've been helping them with their Kamen Rider Stronger releases for the past few months, and last week we decided to devote our time to getting a new episode ready. We're also helping them with their v2 release of Kamen Rider Kuuga, bringing the whole (K)uuga (I)nvestigation (T)eam thing full circle, I guess! So keep an eye on their page for new releases. As for us, come back next week for Skyrider 27. 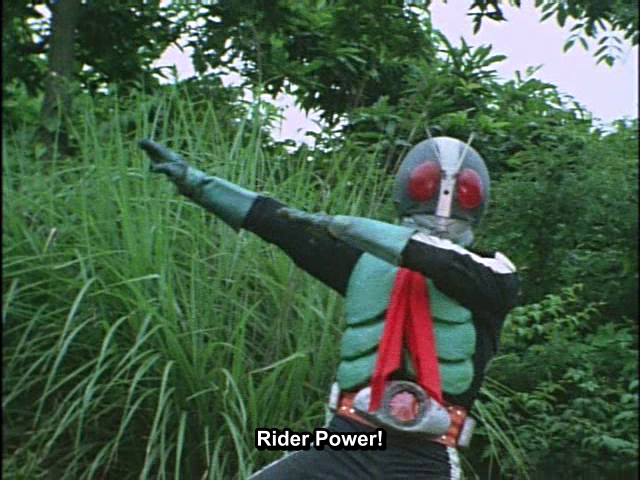 Skyrider is overpowered, and his strength just isn't enough. But maybe the help of a whole legacy of Kamen Riders will be able to overcome the odds! You mean their Kamen Rider Stronger release of the past few months? I was hoping they were back on track, but now that I know it was you guys helping them, I guess I probably shouldn't expect any more episodes of Stronger for a long time. Guys might want to move your stuff. All the files are on fileserve. I can't download them without upgrading. Can you reupload them on KRDL?